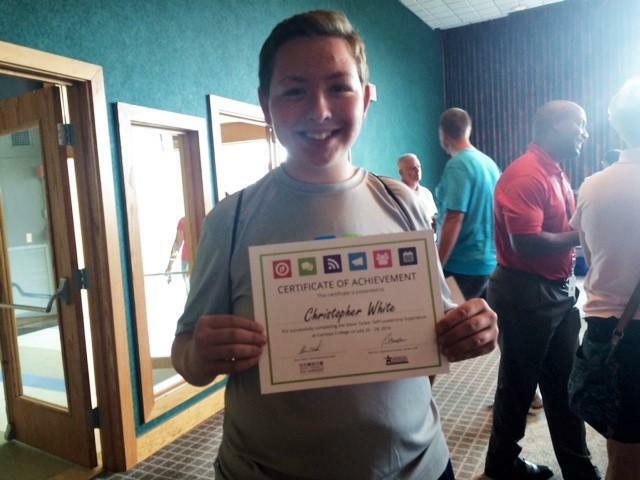 One of the nearly 50 area students to receive a certificate for completing the Steve Tasker Self-Leadership Experience at Canisius College. Students receive certificates for completing the Steve Tasker Self-Leadership Experience at Canisius College. Students were called up one by one to receive a certificate and take a photo with former Buffalo Bills player Steve Tasker. The Canisius Center for Professional Development and the School of Education and Human Services presented the program. Tasker, a former Bills Wide Receiver and Special Teams player, developed a program that guides teenagers through making good choices. Student receives her certificate and takes a photo with former Buffalo Bills player Steve Tasker. “And some of the things that get lost in the cracks, that are extremely important, is how to meet and greet people, how to act in a group setting, how to handle yourself inside a business meeting, how to write a good resume, how to keep yourself relevant on social media without making yourself look unattractive or like something you’re not. Not to kill your career on social media,” explained Tasker. Former Buffalo Bills player Steve Tasker discusses why students need to learn interpersonal skills. Tasker describes some as 'small' skills, but he noted they are very important in a young adult’s future. “Sooner or later you’re going to have to look somebody in the eye and have an intelligent conversation with them without having a moment to think about what your text says, so that frame of mind is really what we are promoting at the camp,” Tasker described. “It actually was a lot of fun,” said Christopher White of West Seneca, Canisius High School student. Christopher White of West Seneca, Canisius High School student. White completed the program, proudly holding his certificate. “I learned many things, such as what opportunities can take you. You have to work hard every day, you can’t do it 50-percent of the time and then give up, you have to stay with it, you have to stick with what your gut says to do,” White said. Dialo Rivera Stevens of Buffalo is a Riverside High School student who also completed the program. Dialo Rivera Stevens of Buffalo is a Riverside High School student. “This program – I liked it. It taught me a lot,” responded Rivera Stevens. “It’s helped me out a lot, because I have an extra step above kids that don’t do this program. When I’m doing this, I think differently. Everything I do is just more mature and more different. Everything about me is changing. I’m happy I am here." Rivera Stevens tells WBFO News he learned that everything is possible. “Never shut your dream down, so whatever you think – it could happen,” Rivera Stevens remarked.